Happy Sunday lovelies - I hope you had a great weekend! Can you believe I've been doing the #100HappyDays challenge for more than a month now? Crazy but I've been really enjoying it so far, so here we go. Day 29: First day of university. New school, new people, new city and me right in the middle of it. Oh boy was I nervous! I'm not really a fan of situations like this but luckily everything went great. I'm excited to see what the future brings. 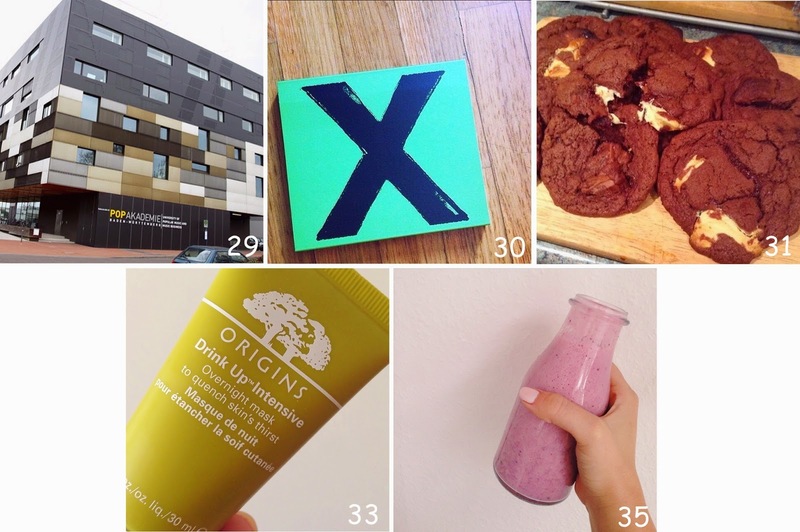 Day 30: Ed Sheerans' Multiply. I think it's safe to say this will be my favourite album of the year. I've been listening to this since the day it was released and I just can't get enough of it. It's perfect. The talent he has is beyond incredible. I can't wait to see him on stage next month! Day 31: On Tuesday night me and some of my lovely blogger friends fantasised about cakes and cookies so I decided it was about time to properly inaugurate my new kitchen and bake some cookies. I tried the #BakingWithTanyaBurr triple chocolate ones and they were amazing. I have to say I'm not so bad a baking after all. Day 32: Thursday was quite a busy day. I was at university until 5 p.m and then I had one hour to get ready for dinner and drinks with the training staff and all my fellow students. Imagine about 40 people in a room, all sharing the same passion - it was great! Day 33: Friday was a holiday here in Germany and I thought it was the perfect opportunity for a pamper day. I put on my favourite mask for dry skin (review coming soon), did my nails and watched some O.C California one of my all time favourite TV series. Day 34: Gotta love those days you spend in bed with your head feeling like it's gonna explode - especially when you have plans for the evening, ugh. Day 35: If you haven't noticed already Sundays are my lazy days. I usually stay in bed, catch up on some YouTube videos and relax. This morning I made a delicious breakfast smoothie with loads of berries and a banana - yum!